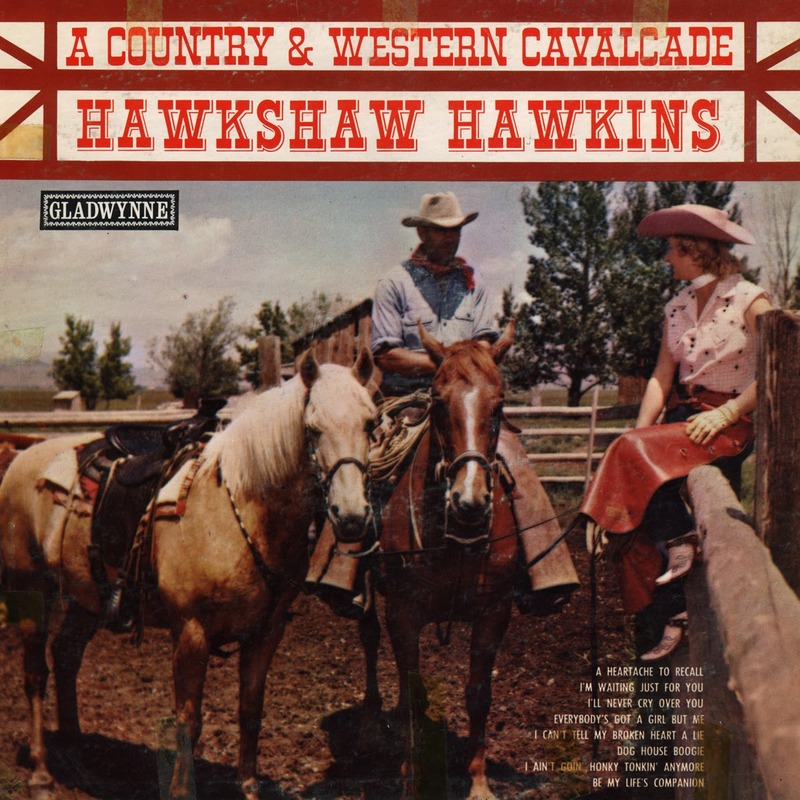 One of the most common requests I receive from followers of the Scratchy Attic is to post LPs by Hawkshaw Hawkins and Cowboy Copas. Interestingly, people usually request both artists together, as in "Can you post some albums by Hawkshaw Hawkins and Cowboy Copas?" Of course, the only definite association between the two artists, besides having recorded for the King label, is that both perished in the March 5, 1963 plane crash that also claimed the lives of Patsy Cline and manager Randy Hughes, who was also Copas' son-in-law. In response to said requests, I offer this pair of albums. "A Country & Western Cavalcade" appears on the mysterious Gladwynne label. The albums' jacket and labels contain no address or parent company, and all I know about Gladwynne is that about fifteen releases, mostly pop and jazz, appeared on the label in 1962 (some discographies list this LP as being released in 1959, but I believe that is false). One of the rarer Hawkins LPs, it contains eight of his early King recordings, clearly taken from 78 rpm sources. Whether this release was officially sourced from King Records or not is unknown, but it seems doubtful. Perhaps such illegitimacy accounts for the label's short run and obscurity; these LPs were probably made quickly on the cheap to be sold by hinterland dimestores. Of a more legitimate nature is the Cowboy Copas LP on Starday's budget Nashville label. Using his 1960 hit "Alabam" as a title track, it features eight of his early 60's Starday recordings along with two instrumental tracks, "Oklahoma Swing" by Tommy Hill's String Band (a Starday Studio band that released an LP, SLP-210 in 1963) and "Texas Quick Step" by Red Hayes and Hank Singer. Padding releases by a name artist with two anonymously credited instrumental tracks was common on early Nashville label LPs. "A Country & Western Cavalcade"
"Alabam & Other Memorable Hits"
Thank you for sharing! The old stuff is certainly the good stuff, eh?